Los Angeles, the city of Angels, is situated on the coast of the Pacific Ocean in sunny California. L.A., as the local inhabitants call it, counts amongst the greatest agglomerations in the world. The city became world-famous because of Hollywood, the Mecca of show business. In 1910, film producers discovered the region as the perfect production location. The rest is history. 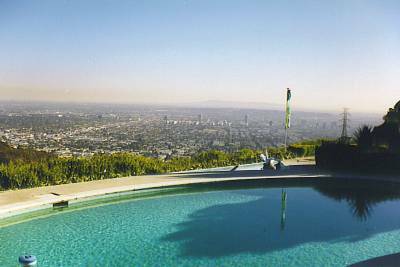 View from the villa of one of Lex Barker's friends on Mulholland Drive, 1999. When Lex Barker came to Hollywood in 1945, many of the city's famous landmarks already existed. The 'Hollywood Bowl', a natural amphitheatre and venue for great concerts, opened in 1922. 'Grauman's Chinese Theatre', built in the style of a Chinese pagoda on Hollywood Boulevard in 1927, features the hand- and footprints of the 'immortals' in front of its entrance. It served as the venue for the 'Oscar' award ceremonies during Lex Barker's time in the movie capital. 'Grauman's Egyptian Theatre', built in 1922 in a pseudo-Egyptian style, is more or less just around the corner. 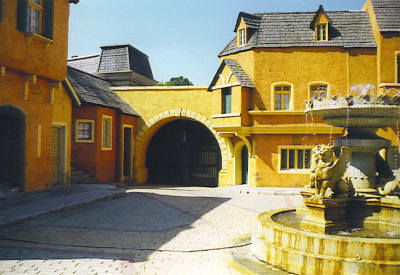 Streetscape at Universal Studios used to shoot scenes for "The Girl In The Kremlin"
The studios of 20th Century Fox, where Lex Barker worked in 1945, existed in that form for ten years already. Other, well-known production companies had been founded even earlier, like MGM in 1924, Universal in 1912 or RKO (Radio-Keith-Orpheum) Pictures in 1929. Lex worked for several of them during his years in Los Angeles. When Barker arrived, the 'Hollywood' sign, the famous writing in the Hollywood Hills above the city, hadn't quite attained the significance it has today. The lettering 'Hollywoodland', installed in 1923 by a realtor, had become utterly dilapidated by the mid-forties and the letter 'H' had fallen over. 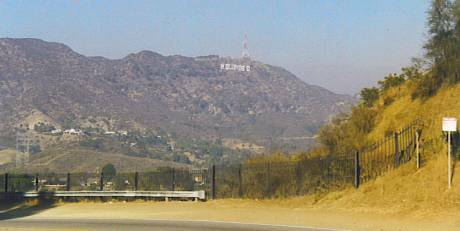 The now-legendary sign 'Hollywood' was only installed in its present form in 1949. The Roosevelt Hotel was a well-known meeting place for movie people, situated directly on Hollywood Boulevard. It was named after the twenty-sixth president of the United States, Theodore Roosevelt (1858-1919), financed by a group of investors including people like Douglas Fairbanks Sr. and Louis B. Mayer. With its twelve floors, the two-and-a-half-million-dollar project became the jewel in the crown of golden Hollywood. In 1929, the first presentation of the 'Academy Awards', the film 'Oscar', was held in the Roosevelt Hotel. The walls of the 'Tropicana Poolside Bar' or the 'Dakota Bar' still conjure up hints of Hollywood history. Professor Henry Breitrose, Stanford University, describes the movie capital in the book Tarzan And Hollywood, (authored by Reiner Boller and Julian Lesser): "'Hollywood' is more a state of mind, rather than a part of Los Angeles. Anthropologist Hortense Powdermaker undertook an expedition to 'old' Hollywood, and, in 1950, reported her observations of the local population in her book 'Hollywood, the Dream Factory'. 'Hollywood' is, perhaps, the first indication of the post-modern situation where the border between reality and fiction is invisible...". The film industry probably chose that part of Los Angeles because of its better climate and the longer hours of sunshine, compared to New York. Life was simply better along the palm promenades and beside the swimming pools. An important man in Lex Barker's career: Lee Sholem (1913-2000). The director of the first two Tarzan movies with Lex Barker enjoyed the view onto the film metropolis. At the same time, the name 'Hollywood' is used as a metonym for the US cinema as such, because most of the studios, as well as the homes of the stars are located outside Hollywood. Universal City, founded by German movie pioneer Carl Laemmle, is located in the San Fernando Valley. The film sets, through which Lex Barker once walked, still exist (see article: On Location). 'Tarzan' production company RKO Pictures and its classic logo (the revolving globe with the blinking radio tower) have also survived, although with difficulty. Other owners have moved into the erstwhile studios. The former RKO Studio on Gower Street belongs to CBS Paramount Television today, RKO-Patheacute; Studio is owned by a company called PCCP Studio City Los Angeles, and the back lot, RKO Forty Acres, where scenes for three Lex Barker 'Tarzan' movies were recorded (Tarzan's Magic Fountain, Tarzan's Peril, Tarzan And The She-Devil) has been razed to the ground in 1976. Today, it accommodates Hayden Industrial Tract. The stars, including Lex Barker, lived outside Hollywood. 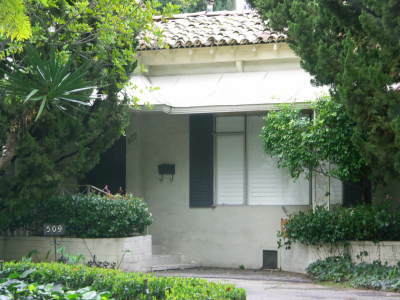 Their domiciles were located mainly in the western suburbs of Beverly Hills and Bel Air. The elegant villas of the celebrities were, and still are, distributed across the hilly landscape (motto: 'the higher up and the greater the seclusion, the more expensive') and surrounded by manicured gardens. Tours around these neighbourhoods are an attraction nowadays, but the mansions are mostly obscured from the streets. During Lex Barker's time in 'Tinseltown', as Hollywood was mockingly dubbed by its critics, the multitudes of tourists that descended upon the place later, didn't exist. He lodged in some magnificent houses along boulevards where modern movie greats would no longer be able to live undisturbed. 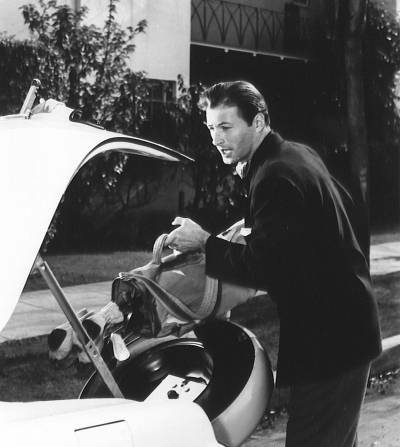 During the years that followed, Lex Barker occupied several houses in Beverly Hills. His first address was on Suyler Drive. 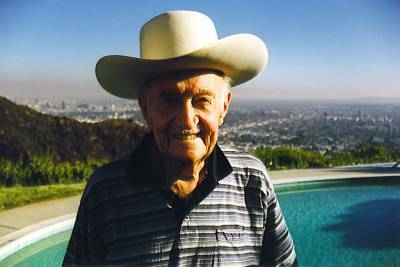 Afterwards, he moved into a larger estate on Mulholland Drive, Laurel Canyon, with his first wife, Constanze Thurlow (Connie). His neighbour at the time was none other than Errol Flynn. He lived on Alpine Drive when he met Lana Turner. The street connects the western Sunset Boulevard and the Santa Monica Boulevard. Still today, visitors driving along the broad avenues past the elegant houses can easily imagine being back in the fifties. Thanks to the limited amount of traffic, this stretch of L.A. offers respite from the main arterial thoroughfares, which are still within reach. As the visitor steers the car along Alpine Drive in the evening, the street lights create a special ambiance in combination with the external lighting of the villas and conjure up the Hollywood charm of days gone by. A little further south, Fox Hills Drive isn't as broad and leads across several hills. Large trees afford welcome shade. On top of a little hill stands the small house that Lex Barker rented around 1952. The previous occupant, Lex's colleague Patricia Neal, moved out when her affair with Gary Cooper came to an end. At that time in between marriages, Lex Barker led the life of a bachelor. 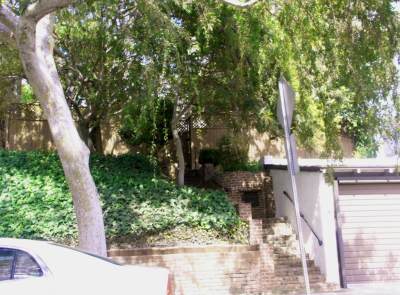 Earlier, Lex and Arlene Dahl had also lived in a small house on a hill overlooking Olympic Boulevard. To reach the front door, a large number of steps had to be climbed first. 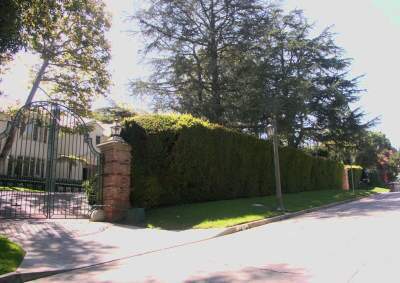 Substantially more pompous in appearance is the house on Mapleton Drive that Lex Barker and his then-superstar wife, Lana Turner, later called home. The driveway is framed by two brick columns and the two-storey main house is set further back, protected from prying eyes. Here, too, the street is broad, however, the drive leads past tall hedges and impressive driveways. After his return to the USA in the early seventies, Lex Barker lodged, among others, on the southern end of Beverly Drive. On the day of his death in Los Angeles, the fifty-four-year-old wore a wrist watch with a Beverly Drive address engraved on its back. 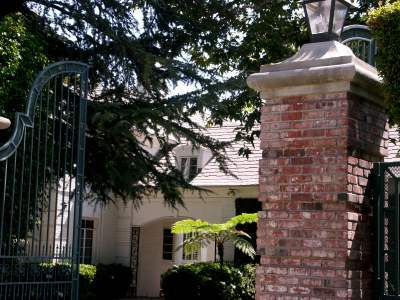 His last place of residence in Los Angeles was in the suburb of Sherman Oaks, along Magnolia Boulevard. 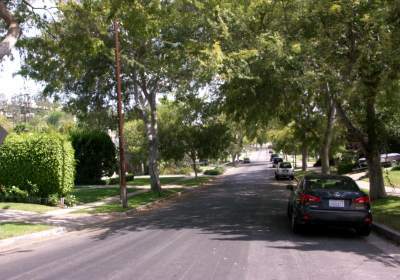 The San Fernando Valley region of the City of Los Angeles is a little further removed from Hollywood but still within easy reach of the most important film sets, yet distant enough to evade the hustle and bustle of the more hectic or, rather, more exclusive suburbs of Beverly Hills and Bel Air. Where did the Hollywood actor go for a bite to eat? 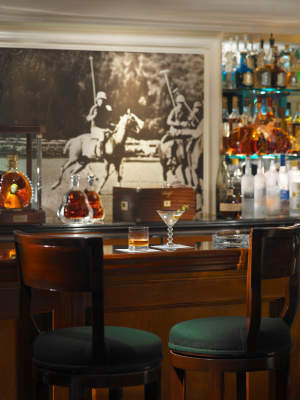 Karen Kondazian remembers: 'The Polo Lounge in the Beverly Hills Hotel was one of Lex's preferred places for brunch. Then, we often went to the restaurant La Scala and, naturally, to Musso & Franks'. The luxurious, five-star Beverly Hills Hotel opened in 1912 on Sunset Boulevard and is the most famous hotel in the history of Hollywood. In addition to the main building, there are extensive, tropical gardens all around, which serve the guests as a place of rest and recreation amongst their exotic plants and along private walkways. The Polo Lounge is probably the most popular breakfast place for generations of actors and other movie people. Apart from Lex Barker, stars like Elizabeth Taylor, Charlie Chaplin, Marilyn Monroe, Frank Sinatra, Johnny Weissmuller, John Wayne, and other public figures, such as the thirty-fifth president of the USA, John F. Kennedy (1917-1963), regularly frequented the venue. 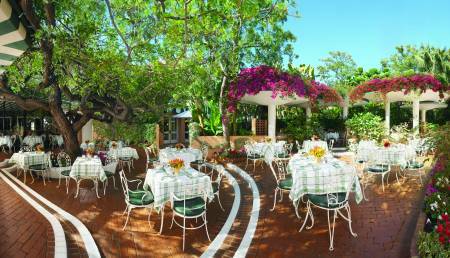 It is still worth visiting for Sunday brunch, accompanied by soft Jazz music in the background, or enjoying the evening ambiance while sipping on a special cocktail. 'The Pink Palace', as the hotel is referred to locally, is the place to see and to be seen. Frequently, a famous face can be glimpsed. Naturally, one can also exuberantly indulge in magnificent luxury, however, such luxury comes at a cost. Nevertheless, this place exudes glamour. The Musso & Frank Grill is a well-known restaurant on Hollywood Boulevard number 6667. It was opened in 1919 by Joseph Musso and Frank Toulet. And it just so happens that 1919 is also Lex Barker's birth year. That's why he liked dining there. Hollywood's oldest restaurant still exists. Why not pop in and have dinner in one of Barker's favourite eateries — at an acceptable price? Hollywood flair included! 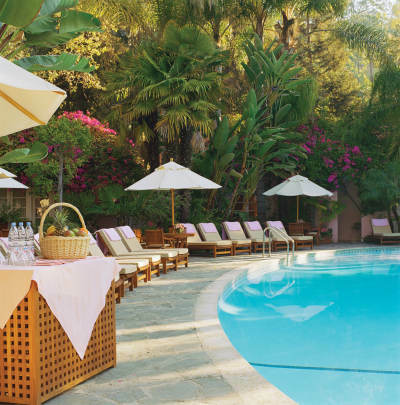 Hotel Bel-Air on Stone Canyon Road is another de-luxe hotel where stars of the fifties met. Perhaps even a trace more exclusive than the Beverly Hills Hotel, this place, built in a colonial Spanish style, has retained its air of Hollywood history. By the way, the first Tarzan photographs of Lex Barker wearing nothing but a loincloth were taken near the pool of this hotel. In 1956, Spanish immigrant Jean Leon opened his restaurant La Scala in Beverly Hills. Immediately, the establishment became the rendezvous place for Hollywood's VIP's. The restaurant still exists, although, since 1989, on a different location in Beverly Hills. Having said that, one of the hottest Hollywood night clubs during the forties and fifties of the twentieth century was, indeed, Ciro's. The greats of Hollywood went there to have a drink, to be seen, and to be served by the so-called 'cigarette girls' in short skirts and stilettos. The list of entertainers at the time reads like a who's who, from Jerry Lewis and Dean Martin, Xavier Cugat, Marlene Dietrich, to Frank Sinatra and Sammy Davis, Jr. They all performed at Ciro's. Alas, as with most clubs, at some stage, the enthusiasm of the guests cools and they look for new attractions. Ciro's closed its doors in 1957; today, Sunset Strip number 8433, is home to the Comedy Store. For a while, the Mocambo at number 8588, which was built at the same time as Ciro's but on the other side of the street, was the new top spot of Hollywood and, with its exotic jungle ambience, out-performed it's opposition. 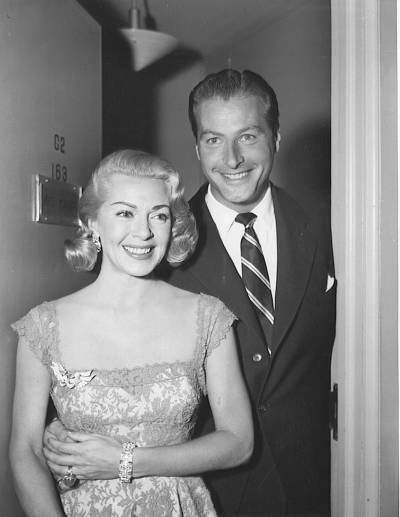 The enthusiastic dancer, Lex Barker, loved to lead the ladies of his heart, Arlene Dahl and Lana Turner, onto the dance floor of both clubs. The Mocambo closed in 1959, a short while after Lex Barker had departed to Europe. Today, the address belongs to a parking lot. The Trocadero, number 8610, the third-largest nightclub in Hollywood during Lex Barker's time, met with the same fate. However, that club was already on the way out when Barker arrived in Hollywood and closed its doors in 1946. 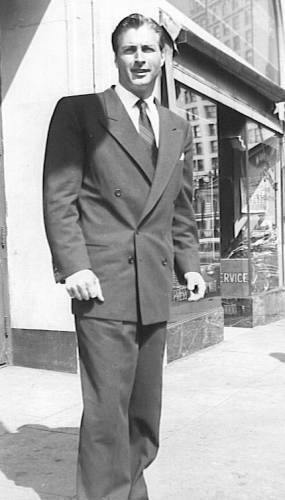 Andrea King, one of Lex's colleagues remembers a huge New Year's Eve party in the Trocadero with Lex and his wife Connie and describes it in "Boller/Boehme biography" about Lex Barker: "We had a wonderful time together." The once-famous club on Sunset Strip has been demolished a long time ago; today, another building is adorned with the same name, but fails to even get close to the class and style of the original. 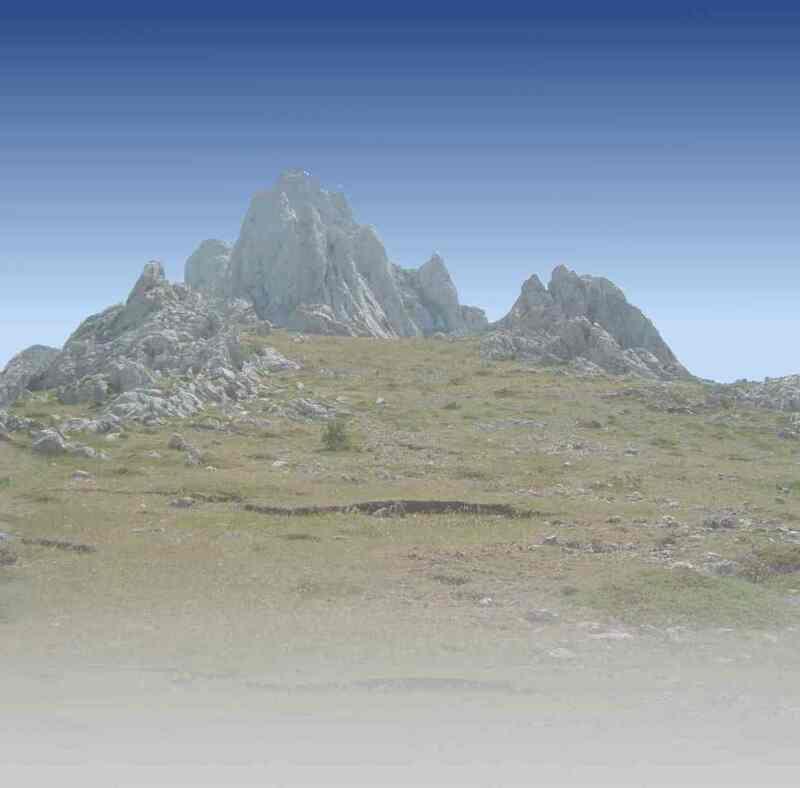 The 'Strip', a stretch of road of around one-and-a-half miles, is comfortably covered in around two hours on foot. It still gives a good impression, especially in the evening, although the glitz and glamour of the days gone by have vanished. It is not only Hollywood that offers an array of great places, but also other parts of Los Angeles where Lex Barker passed time, and they still invite visitors to follow suit. The Ocean Avenue in Santa Monica is close to the coast. That's where Chez Jay is situated, a restaurant that has been attracting locals, visitors and celebrities since 1960. Owner Jay Fiondella, meanwhile, has become a VIP in his own right. True to its motto: 'Nothing much has changed at Chez Jay', the establishment continues to be a meeting place for movie people. There remains only one more spot to be mentioned in Hollywood — the Walk Of Fame. The trail of stars stretches along both sides of the Hollywood Boulevard for more than eighteen (!) city blocks. 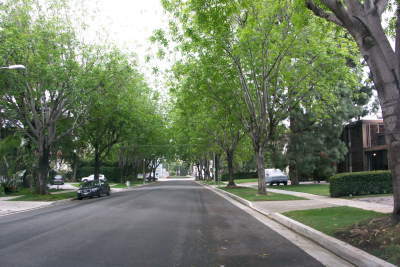 In addition, the famous 'Walk' extends to nearby Vine Street. Thus far, more than two thousand three hundred and seventy stars have been placed to honour celebrities of, above all, the entertainment industry of the United States of America. The Chamber of Commerce has issued stars since 1958. 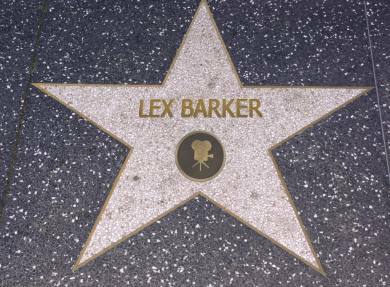 However, an important name from Hollywood's history is still missing — Lex Barker. Once again, in the year 2009, when the popular actor would have celebrated his ninetieth birthday, there will be an application to the Chamber of Commerce for the award of a star on the Walk Of Fame. This means: keeping the fingers crossed for Hollywood to honour unforgettable Lex Barker. Our wish: A star for Lex!